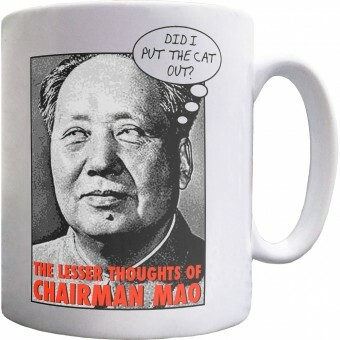 Familiar as we are with the "Thoughts of Chairman Mao", as collected in his "Little Red Book", but who was to know the esteemed revolutionary founding father and mass-murdering psychopath would have some lesser thoughts too.... such as "is Tiddles going to be shredding my sofa when I return home having defalcated on my bed?". We feel somewhat concerned for Tiddles. A mug featuring a cartoon by renowned cartoonist Clive Goddard.